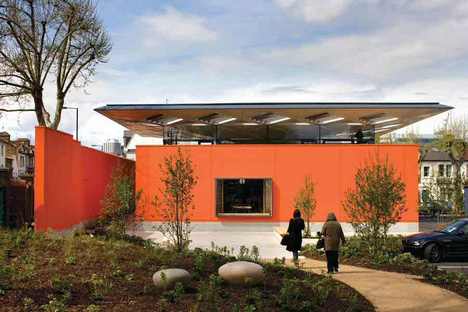 Considering the Royal catfight over Chelsea Barracks and the nixing of the British Museum extension, 2009 hasn't been kind to Richard Rogers, so a piece of good news was overdue: the Maggie's Centre at Charing Cross hospital designed by Rogers' firm has won the Stirling Prize for Architecture. The centre is the sixth to be built in the name of Maggie Keswick Jencks, who died of cancer in the mid-Nineties, and the first located outside of her native Scotland. It was praised by judges for "[generating] an immediate and pervasive sense of welcome, warmth, serenity - and even love - in the context of a frantic Hammersmith thoroughfare". That's a list of adjectives you certainly don't often see associated with the delights of downtown Glamoursmith. This is the fifth time in a decade that a London building has claimed the prize, and the odds were stacked in the capital's favour: the shortlist was half-filled by London projects. For Rogers and co, it'll be another gong to stick on the mantlepiece, next to the Stirling they nabbed in 2006 for Madrid's Barajas airport.